Click here to host an SCC Intern! Join us on Linkedin group name: SCC Work Experience. Work Experience Education, also referred to as: Occupational (OCED 090) & General (OCED 091) Work Experience Education assists you in applying what you have learned in the classroom to your job or internship and earn college credits for the work that you do! While adding valuable experience to your resume, you will acquire on-the-job skills that contribute to your occupational goals. Credits can be earned for part-time or full-time work, work-study, or an internship. You may enroll in Work Experience whether you are paid or unpaid. Work experience can also assist you in making effective career choices and developing lifetime career plans. Occupational Soft Skills (OCED 070) is a 1 1/2 unit course preparing you for the skills required to be a successful member of the workforce. This is not a Work Experience course and does not require any type of job. Occupational Portfolio Development (OCED 071) is a 1 1/2 unit course preparing you to showcase your skills in a well-crafted digital portfolio that is essential to becoming a successful member of the workforce. This is not a Work Experience course and does not require any type of job. 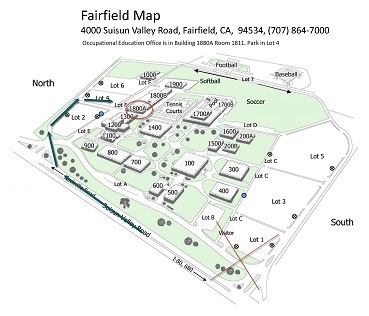 Our office is located in Building 1800A next to the tennis courts.